Many of the books that have shaped my reading life in profound ways have maps at the start. Before the reader finds any text they are invited to pore over the landscape of a fantasy world. There might be bordering countries, or a region, or a large city with all of its crooked streets picked out. Topographical details may be sparse or plentiful. Whatever the case, these maps usually herald my favorite sort of story: A journey, a courageous hero or heroine, and triumph over evil/survival/happily ever after to top things off. When I picked up Leah Bobet’s An Inheritance of Ashes, all I knew about it was that I loved the author’s previous book, Above, and that it was set at end of the world. When I leafed through the pages and saw a map at the start, I had a good feeling – and the book did not disappoint. 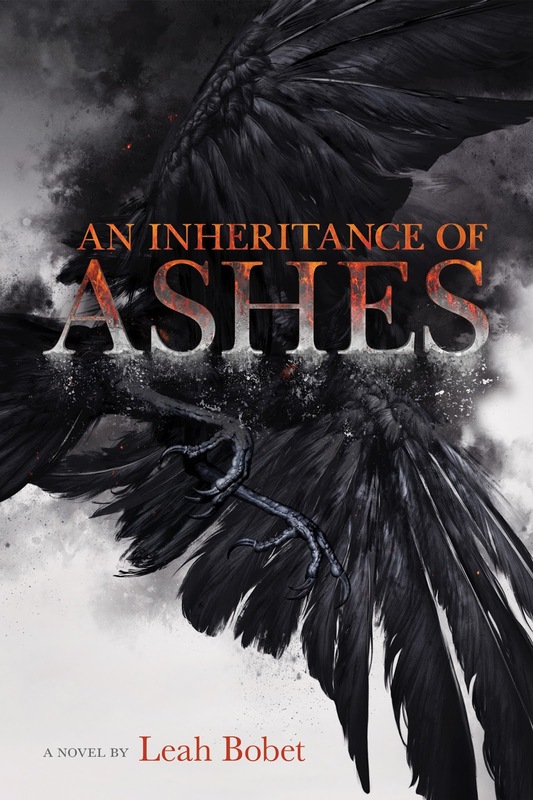 An Inheritance of Ashes is beautiful, fierce, sad, and by far my favorite of all of the books I’ve read in the past year. This is the story of a family. This is the story of the aftermath of war. This is the story of a battle on the homefront. This is the story of survival generations after the apocalypse. This is a story about a teenage girl. This is a story about fear. This is a story about breaking apart and (maybe, eventually) healing. All of these statements are true, but they don’t tell you everything. Hallie Hoffman is sixteen, and half-owner of Roadstead Farm. She and her pregnant sister Marthe are trying (and mostly failing) to hold themselves together in the wake of the war against the Wicked God – a war that took Marthe’s husband Thom, along with any innocence they had left. When she hires a traveling veteran, Hallie doesn’t expect it to spark anything, except maybe a prayer of keeping up with the farm chores. Secrets old and new follow, endangering and changing Hallie, Roadstead Farm, and their world. Did that sound suitably ominous? The book isn’t all death and destruction – it’s a nice mix of tension with bits of light. The prologue made me cry in public, and that’s when I knew for sure that the book would wreck me. Things I liked? A) Hallie and Marthe’s messy sister relationship, and how that played into everything Hallie said and did throughout the story. B) The reality of broken relationships, and the saving grace of kindness, forgiveness, and second chances. C) A romantic relationship that was authentic to the setting, the characters, and the crazy situation. D) The immediacy and intimacy of the setting, without sacrificing big-picture world-building. 2. Craft. The writing is just superb – not only poetic (it is, in a way that screams TRUTH while the emotion it evokes absolutely rends your heart) but intricately arranged for maximum impact – no word or detail is left orphaned. An Inheritance of Ashes is a masterwork. It is not only gripping and fantastically entertaining, but beautiful, in the way that Gregorian chants, or ancient temples, or roads thousands of years old are (to me). The sheer work that went into fitting every word like a puzzle piece to make a whole, of showing a little bit, but never letting on too much or boring the reader… is awe-inspiring. I do not kid myself that An Inheritance of Ashes will appeal to everyone (it won’t, books never do in the end), but I know I can’t be alone in thinking that this book is just… art. ART, in all capital letters. Thinking about it makes me want to do better, and be better. It’s freaking inspiring. Recommended for: those who enjoy science fiction and fantasy, and anyone who likes strong characters and spellbinding plot in equal measure. All right then! I will read it! You had me at "aftermath" -- I will read virtually anything that someone describes as being about aftermath. In fact I may just go read the Scouring of the Shire bit of Return of the King right now because I feel like it. I love this book so much. I started reading it and couldn't put it down. It is so lovely, and comes together so well. Wow, best book you've read in a year? High praise! I haven't read Above but everything about this review of yours is making me interested in Inheritance of Ashes. It sounds like so much more than the typical YA dystopian! I initially thought this book was an alternate history Civil War novel (something that happens more than you would expect to me) and I've been unsure about the book since then. It doesn't sound like my bag per se but I will have to consider giving it a shot based on your extremely high praise. Thanks for the review!